Life is looking rosy for Florrie Fox, manager of the Color Me Read bookstore in Georgetown, Washington D.C. She's working on an adult coloring book of gardens, her romance with Sergeant Eric Jonquille has entered a new chapter, and the bookstore's weekly coloring club is a source of friendship and entertainment. No member is more vibrant than Dolly Cavanaugh. Dolly likes to say she was blessed with beauty and cursed with lousy husbands, but at least she has a grown daughter and a stunning brownstone to show for it When Dolly's love of garage sales results in her showing up at Color Me Read with a rare book in hand, Florrie is astounded. The Florist, the earliest known coloring book, was first published in 1760. An original copy would be worth a fortune-and someone else knows it. 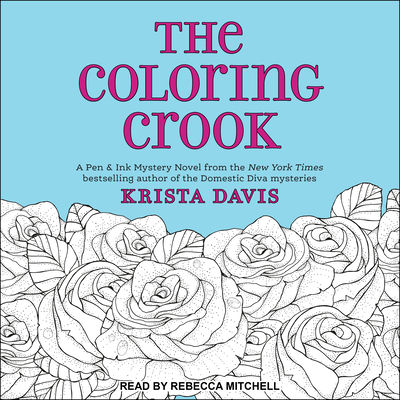 That same evening, Florrie finds Dolly dead on the floor of her apartment, a corner of a coloring book page clutched in her hand. As Florrie delves into Dolly's past and her personal effects, she discovers a skeleton in the closet-literally-and a whole lot of shady suspects. One of them is an expert in the fine art of murder, but can Florrie draw the right conclusion?